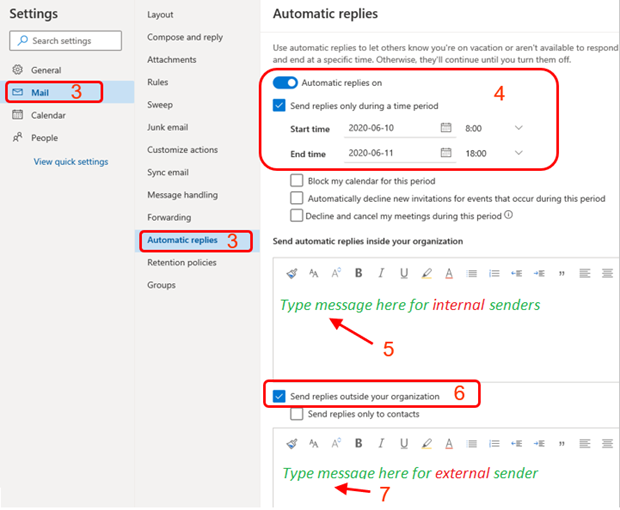 You can set up Automatic Replies (Vacation Notice) in your Office 365 (O365) account in Microsoft Outlook or Office 365 Outlook Web App (OWA - O365 Webmail). For the setup procedures of MS Outlook 2010, please refer to here. "Internal Sender" means that email sender is also a CityU O365 user whose Email Address ends with "@um.cityu.edu.hk" or"@cityu.edu.hk". If you type nothing in text fields and the Automatic Replies are enabled, senders will not receive an auto-reply message eventually. Select Don't send automatic replies to disable them. Automatic Replies are disabled by default.